These giant stampers are a great way for young artists to express themselves while learning a variety of basic skills. Each foam stamp is 3" in diameter and is mounted on a clear surface with a comfortable child-size handle, plus a directional sticker for perfect alignment! Ideal for use with paint or ink-pads, each convenient set offers spectacular varieties and designs. Stamp pads sold separately. 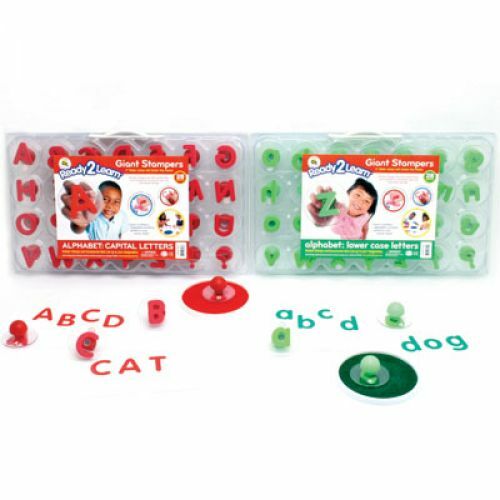 Giant Collection includes 3 sets totalling 164 Stamps: Alphabet Letters Giant Stampers 56 stampers includes 28 upper and 28 lower case stampers. Creative Designs Collection 48 stampers includes 6 each of Animal Footprints, Dinosaurs, Wild Animals, Pattern Blocks, Celestial, Celebration Art, Creative Designs, and Insects and Imaginative Play Collection of 60 stampers includes 1 set each of Numbers 0-9, Geometric Shapes, Sea Adventure, Sea Creatures, Imaginative Play 1 and Imaginative Play 2.